Yep, I caved and got some creepers! This whole things a bit of a strange love story really. I'll be honest, initially I really wasn't a fan of creepers. But, eventually, after seeing them on numerous (wonderful) blogs I decided I'd have to give them a go. After all, I've become a fan of the flatform look - actually, I love anything that can grunge up feminine outifts, as I'm not very 'girly'. I was lucky enough to have be given the chance to choose some shoes from Barratts the other week - the perfect opportunity to try out some creepers! If you're still not sure about creepers you should definitely look at the Barratts creepers range - they have a multitude of colours and styles! But my favourite were the grey ones, so I chose them to review. The photo I uploaded on Twitter of me wearing them on the day they arrived resulted in some great comments! I found them pretty comfortable, but I'm not used to walking in flat shoes (I pretty much never wear completely flat shoes), so it does feel a little odd! I think I could do with a 5.5 (I got a UK 5 as there were no half sizes and I'm usually a 5 / 5.5) as my toes are a bit squashed at the ends. Apart from that, they didn't rub my heels (like so many new shoes do! ), so that's super, and I absolutely love how they look with my pastel shade dress here. I'm so glad I picked the grey! Also Barratts have 30% off for 2 more days, so you can grab these for £21! Have you come over to the creeper-side yet (that sounds scary haha!) or have you always loved them? What colour would you go for? Ps. I announced the winner of my giveaway, Ashleigh, on Twitter yesterday! Congratulations to her! Love the fur collar and the creepers are gorgeous! 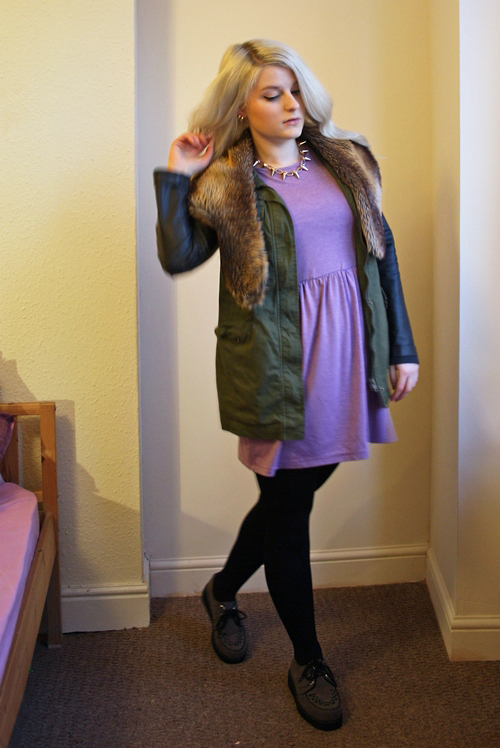 I love that lavender dress & fur collar. 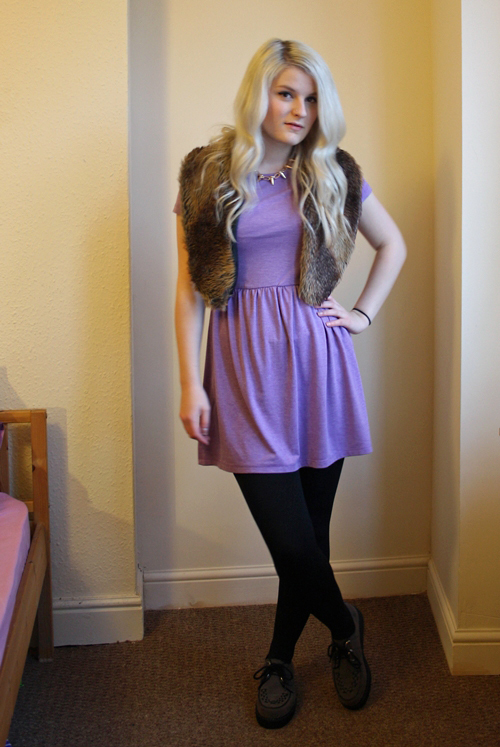 Loove this look, your dress is such a gorgeous colour and I really like the fur stole and necklace. I love those faux fur vests. Lovely outfit! I've recently got into creepers too, I've never seen a grey pair before, thank god I saw this in time and might get some with the 30% off! The creepers look great, I'm really tempted to buy some in black.